There are several reasons why having a fence installed, especially privacy fencing, is a good idea for any property and property owner. 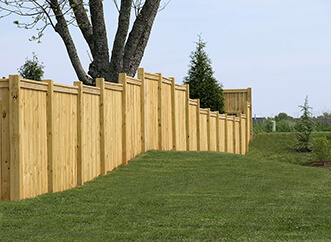 Privacy fence installation from Fence By Maintenance Service combines personal style with effective fencing services to create the most pleasing and beneficial fence system possible. We make sure that every privacy fence installation is done correctly and effectively every time. Privacy fencing, of course, yields privacy and a sense of coziness within a space, but there are multiple additional benefits as well. This type of fencing also enables the defining of property lines. Some neighbors may be particular about their own spaces, so defining the line between your space and theirs will help to prevent disputes and to keep neighbors neighborly—just be sure to have a gate that allows for the occasional friendly visit. Privacy fencing also has a positive impact on the level of safety and security the property it is defining has. When privacy fencing is installed, it creates an intimate space where kids, pets and other guests can relax without worry. This privacy is for both you and your belongings, since privacy fencing also makes it more difficult for burglars, wild animals and other unanticipated visitors to trespass. Overall, the benefits to privacy fencing installations from us at Fence Maintenance Services are aesthetically pleasing and a cause for peace of mind. There are many different types of materials to choose from when finding your own style and designing your privacy fence. From all vinyl or wood finishes, to panels of stone or concrete, several materials can be used to customize the textures of your privacy fence. No matter what your style or reason, at Fence Maintenance Services we skillfully install only high-quality privacy fencing that will meet all of your specific needs and desires. Call today for more information on our fencing installations and other fence maintenance services, or to schedule a consultation now!